The first official week of the preseason is upon us, and started off with a whopping seven games on Thursday night, treating fans across the country with the first glimpse of some impactful rookies, players who may get starting nods and some surprise guys who may make their respective 53-man rosters. A couple of rookies on the defensive side of the ball stood out for the Eagles while the Packers defense as a whole impressed. 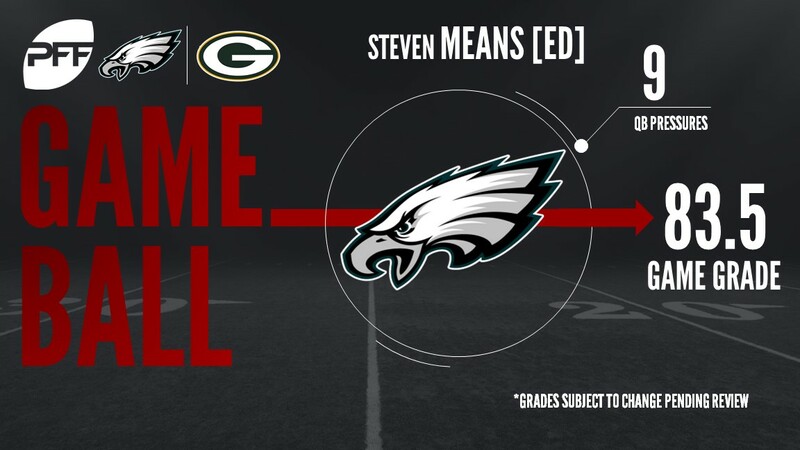 With that, we give you our PFF exclusive takeaways from the contest for each team. McCaffrey was the most-targeted Packers receiver with seven balls thrown his way tonight. He caught all three catchable targets for 60 yards, including a grab of 34 yards against Philadelphia’s Devonta Glover-Wright. It was not a good showing for Green Bay’s right tackles, who collectively surrendered two sacks and 12 hurries on the night. Established starter Bryan Bulaga gave up two hurries in just seven pass-block snaps, and the backup trio of Kyle Murphy (six total pressures allowed), Robert Leff (three) and Kofi Amichia (three) combined for the rest. Amichia’s struggles extended to the run game as well, as his 32.2 run-blocking grade was the game’s low mark..
King might have hoped for more from his NFL debut, but he still put some positive plays on tape. Although beaten deep on a couple of occasions (including a Mack Hollins touchdown), he was incredibly active around the line of scrimmage, making four solid wrap-up tackles to limit receivers to minimal gains. King should only improve from here. Matthews has nothing left to prove in preseason football, but he remains a little way from the dominant force he once was. The trademark burst was evident, but a worrying inability to finish has crept into his game. Matthews missed a pair of plays against the Eagles, including a free shot at Wentz in the pocket. He still racked up a pressure on just five pass-rush snaps for a respectable, albeit limited, pass-rush productivity of 15.0. The Eagles’ season largely rests on Wentz’s shoulders, and flashes like those he produced opening night against the Packers will undoubtedly excite. Shrugging off an unblocked rusher up the middle before tossing a touchdown was the highlight of a promising start to the season. He was accurate on all five of his attempts, seeing his only incompletion dropped, for an adjusted completion percentage of 100.0 percent. Without their star wideout (Alshon Jeffery), Philadelphia hopes their improved depth will shine through this preseason. Hollins began his NFL career with a bang, snagging a 40-yard score in which he broke two tackles with back-to-back stiff arms. In total, he snagged four passes for 64 yards, displaying an ability to get open at every level of the field. He fields a staggering 149.3 passer rating when targeted after his performance. Philadelphia fans have to be excited with the performances put forth by several of their defensive rookies against the Packers, starting with first round pick ED Derek Barnett. Barnett posted an overall grade of 79.6, thanks to two sacks, a QB hurry, four total defensive stops and a pass-rush productivity mark of 17.2. CB Rasul Douglas gave up just one reception for eight yards and broke up pass, and DI Elijah Qualls notched four total pressures and a run stop. Means’ speed off the edge flashed last preseason when he posted 17 total pressures, and we saw more of the same tonight. Against the Packers, he posted nine total pressures, which included two sacks and a forced fumble, all totaling a pass-rush productivity rate of 23.2. Means played just 36 regular season snaps last season, but if he continues to perform on the pass-rush this month as he did this evening, he could force his way into an already-loaded lineup.